The 1977 Mustang Mach 1 included engine and suspension upgrades, a black lower side, black back panel, bright lower moldings, Mach 1 insignia, dual sport mirrors, and optional forged aluminum wheels. Green 1977 Mustang II Mach-1 hatchback owned by Paul MacDonald from New Glasgow, Nova Scotia, Canada. It was our featured Attitude Of The Week photo for 11-9-08. This car has a set of late model wheels with spinners. Actually, 2005 Mustang 16x7 inch wheels with 2-inch spacers. The color is Sorrel Green - 3 coats of base color and 4 coats of clear. It's original color was a yellow gold. Paul tells us more, "I bought this car three years ago and completely rebuilt it. It was repainted by myself in a friend's garage. My late father was co-owner of the Ford Dealership in which the vehicle was originally sold. He would have ordered the car for stock inventory. I have also met the original owner of the car. He approached me at a car show and stated he had been looking for the car. He brought his wife back to see it as he had proposed to her in that car. The car has a 4-speed in it now but I have a T-5 ready to go in." 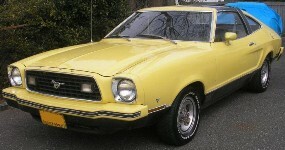 Bright Yellow 1977 Mustang Mach-1 hatchback with T-top roof and a 139hp (at 3600rpm), 302 cubic inch (5.0 liter), 2 barrel V8 engine. The T-top option was originally an extra $629. Silver 1977 Mustang II Mach 1 hatchback owned by Paul from Jackson, Michigan. Silver was a special order color in 1977. This one has the 2.8L engine and manual transmission. Paul had this story to share, "I had just moved to Michigan from Texas. My Father (Doug) had been into car shows and got me interested. LOL when he said, 'I found you a Mustang, lets go look at it.' When we drove up he said, 'There it is.' I said, 'Where?' He said, 'There.' I saw the car and I said, 'No, that is not a Mustang. That is a POS! Where is the pony?' He said, 'On the front and the back.' I looked and said, 'Oh, Mustang II.' It is all original." White 1977 Mustang Mach 1 hatchback with T-tops and the largest Mustang engine offered in the 1977, a 134hp (at 4000rpm), 5.0 liter (302ci), 2 barrel, V8. This was the first year for the twin-panel T-roof option which was only available on the hatchback models. All 1977 models with the T-roof had a wide black band that ran across the roof except for the Cobra II which was color-keyed with the body color. Cream 1977 Mach 1 Mustang II hatchback owned by Dale Jefferson. This Mustang II has a 302ci V8 engine and an automatic transmission. It's our featured Attitude Of The Week starting the week of January 4, 2015. Dale shares this story, "My uncle bought this Mach I new in 1977. I bought it from him in 1985-86. I was T-boned in the drivers door in 1989 and it spent the next 25 years in my Father's barn. Apparently, my Father has been working on the restoration for a while now and surprised me with these photos for Christmas 2014. It is all factory original colors, etc. The only modification was the addition of a tape deck back in the 80s. The only thing I am going to do to it is add some white letter tires. I hope to get home to drive it soon." Tan 1977 Mustang II Mach-1 hatchback with a black underside. It wears a set of Weld Draglite wheels (15x4 front and 15x8 rear). It still has it's original paint! Under the hood is a 302ci V8. It has a floor-shifted automatic transmission.